Mother Teresa Pointillism Portrait Wins! Max Eberle, professional artist from Dover, Ohio, won First Place with his portrait in pointillism titled Teresa In Prayer. 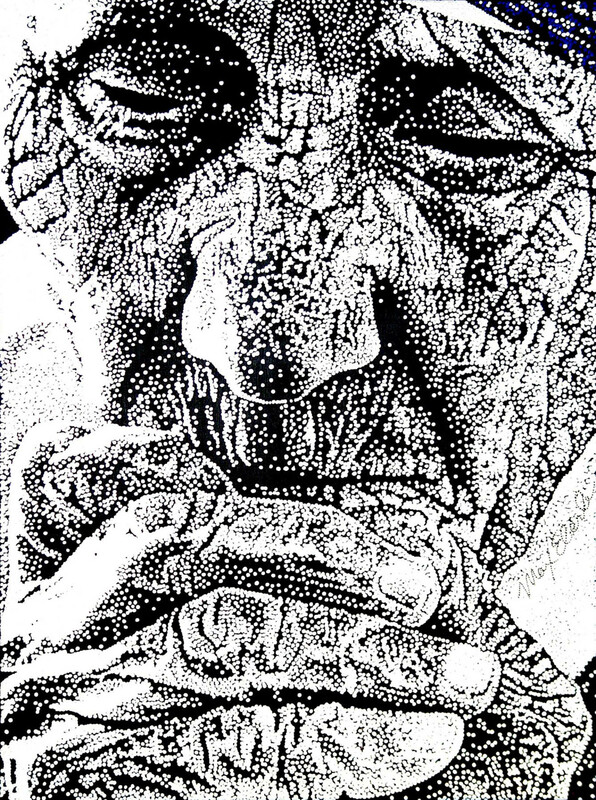 The portrait competition was sponsored by Fine Art America http://www.fineartamerica.com and focused on portraits of famous people in pointillism, a unique style of art which requires painting or drawing with dots or dabs. The competition included forty-one portraits from fourteen pointillists. Max Eberle’s portrait of Mother Teresa stood out as a winning piece. Denise Landis, also a pointillism artist http://www.denise-landis@fineartamerica.com, was the competition administrator and has interviewed the artist to gain a fascinating perspective of Max Eberle’s creative mind and process (c. June 2010). Denise: Tell me a little about your artistic life and art. Why pointillism? When were you introduced to pointillism? Max: Luckily I was drawn to art and encouraged by my parents at a tender age. I know I started to draw at age 3 and remember sitting in the dining room drawing when I was 4. My mom sent me to an after school private art teacher when I was 5 and from there things progressed into winning poster contests in elementary school and other art contests in high school. For some reason, even at 4, I felt I had to draw details such as every blade of grass in front of a house and enjoyed how they worked together to create a lawn. Junior High art class in Arlington, VA is where I learned pointillism. I took to it right away and created many of my favorite works, yet would not take it up again until years later when a friend of mine who owned an art gallery in Arlington saw my portfolio from those Jr. High days. Upon seeing one of my pen and ink pieces with dots, he liked it and exclaimed “You should do this on canvas!” My eyes lit up and I said “Yeah!” He then invited me to participate in his upcoming Good and Evil Exhibition with 8 artists all making one piece to represent good and one for evil. I do have a background in technical drafting and rendering as well from my high school days, so precision work is a nice fit for me, yet I like to combine that with an artistic sensibility and expression. Denise: Describe your specific pointillism method. Has your method changed through the years? Max: I would call my method slow and deliberate. All the pieces submitted in this show are acrylic on canvas, and all are pretty large in scale. Most of them took over a month to complete and up to 4 months on the Michael Jordan and Madonna pieces. Mother Teresa took a month and a half. I’m very careful about where to put each dot, especially when there is a lower concentration of dots because a small change in placement will affect the accuracy and feel of the finished piece. You’ve got to have a feel for the size of the dots you are using and how that affects the contrast you are going for, and you must do your best to keep it consistent throughout the whole piece so it works as a piece, even though the different sections may be weeks or months apart in working time. My method has evolved as I’ve added or decided at time to use different size dots within the same painting. Actually I decided to use all the same size dots in the Mother Teresa piece which creates it’s own challenges in dot placement. Denise: What do you “get” out of creating in pointillism? Max: I get anticipation fulfilled as a piece slowly comes to life. I get the opportunity to really focus on something creative while the rest of the world slips away, the subject of my piece even slips away while I’m so focused on the details of the dots, yet as the person emerges, I get excited and motivated to complete the piece, yet to rush it is impossible as the quality must persist to the last dot. I also get the chance to listen to motivational or educational audio programs for extended time periods while I work. I get to enjoy expressing hand eye co-ordination and the fine motor skill it takes to make a small dot of a certain size with a wet paintbrush. 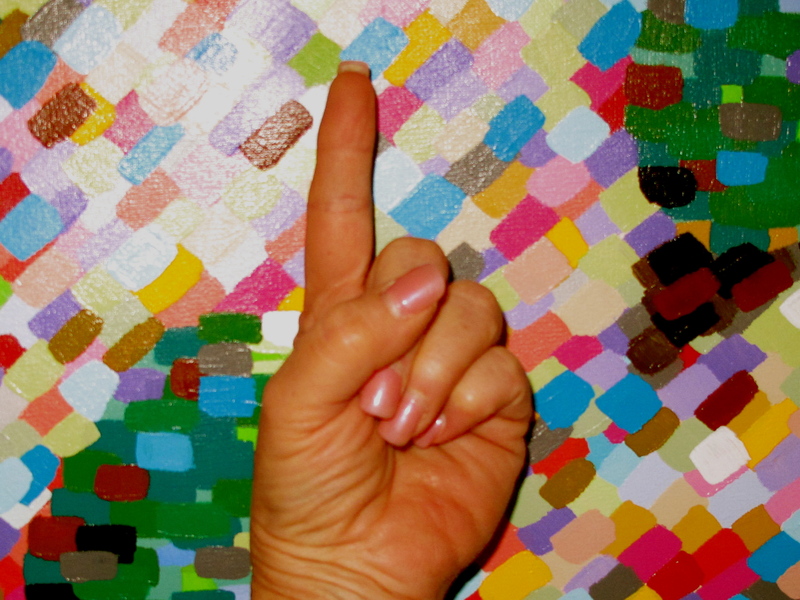 Denise: Are you inspired by other pointillists or artists? If so, who? Max: Actually seeing Seurat’s (Georges Seurat, Father of Pointillism 1859 – 1891) work on Sesame Street as a child always fascinated me. I became a fan of Chuck Close only after I started making my own large scale pointillist portraits, I’ve been accused of being too similar to his work yet I did not even know about his work…I’d say they are pretty different if you examine them anyway. Of course now that I’m part of this group (Fine Art America’s Pointillism Art Group http://fineartamerica.com/groups/pointillism-art-.html?tab=overview) I’ve really enjoyed the work here including yours Denise. Denise: Thanks Max! The group does include some incredible artists and it’s amazing to see the diversity of styles. I’m curious, what was your motivation for “Teresa in Prayer”? When was it created? Do you have other portraits of Mother Teresa? 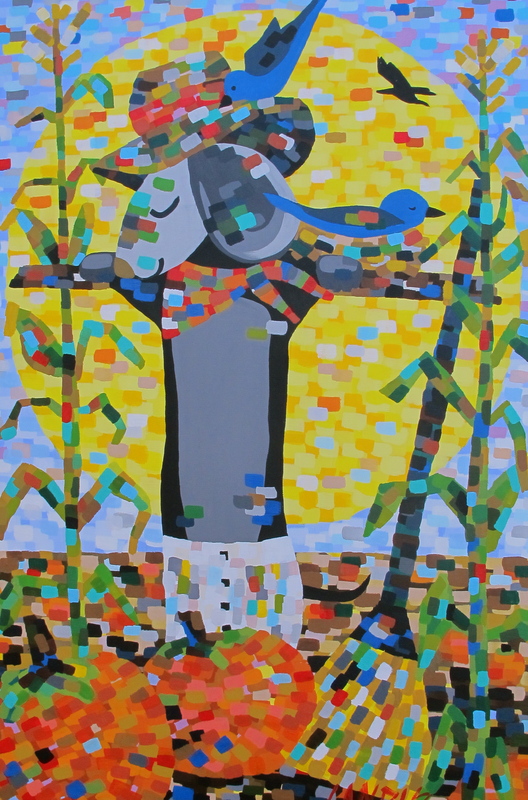 Max: Mother Teresa was my choice to represent “Good” in my friend’s Good and Evil Art Exhibition. He asked if I would paint Hitler for “Evil” and so I chose to paint his baby portrait, which took 3 months to complete. Mother Teresa was the person who I figured best represented “Good,” as her life of loving and giving of herself is the stuff of legend…so that’s how this piece came about in the year 2000. This is my only piece of her and was first printed in a limited run of 200 which have all since sold. Denise: I’m not surprised with your sales success. It’s obviously a piece that many people are attracted to on several levels. What intrigued you about her face as you were creating her likeness? Were there challenges in this portrait? Max: I was excited to do this piece as soon as I found the photo which was on the cover of a children’s book I found in the library. Her expression, wrinkles, hands, and feeling just had that right mixture, plus the light/dark contrast was perfect. I’ll look through hundreds of photos before I pick the right one to use, then I’ll spend lots of time deciding on my crop to capture the essence of my subject. The challenging part to this piece was that my dots were all pretty big so I had to figure out how to convey detail without having small dots. This was actually good practice for my MLK piece which had even larger dots. So you have to figure out how to do more with less at times. 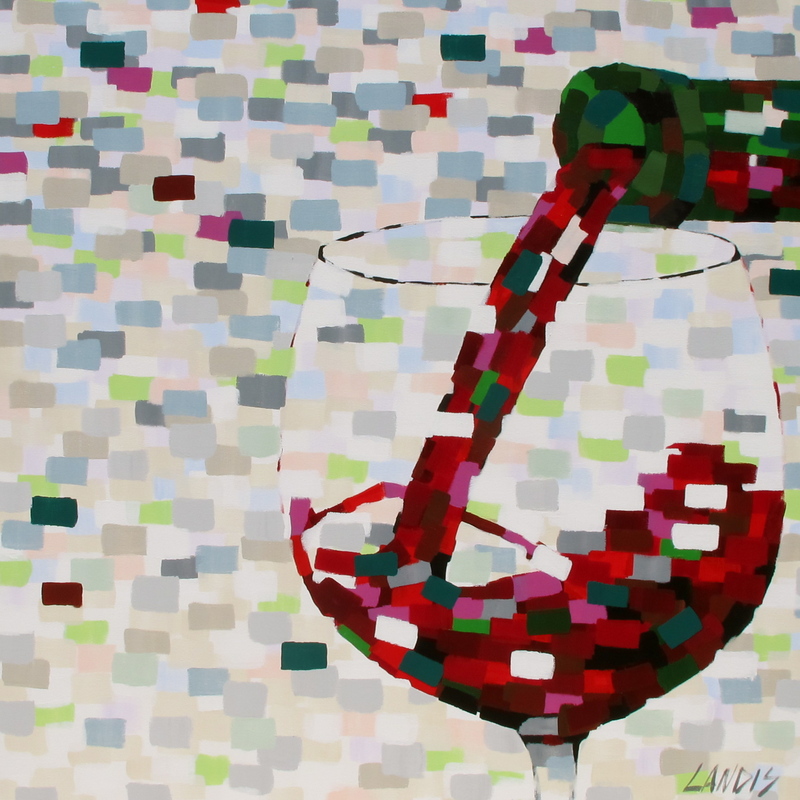 Denise: Did you discover any nuances of pointillism portraiture while creating this piece? Max: I discovered that you can create a different effect depending on whether you use black dots on white background or white dots on a black background. Of course adding color would create a whole new set of variables. There is a little blue in the piece up in her headband that I wanted as a subtle indicator of who she was if a person could not figure it out and also as a reminder of spirit, which is often represented by blue. 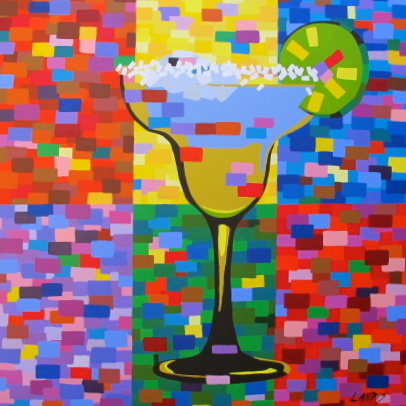 Denise: Is the original art piece available for purchase? And if it is, where? Max: The original could be for sale if the offer was right. I’ve been offered 2K yet refused. If it went somewhere where it would be on display for lots of people such as a busy museum I’d be more inclined to sell it or lend it, otherwise I’ll probably keep it for a while yet and just sell prints. Denise: Have you ever seen Mother Teresa in person? Max: I never did see her in person. Denise: You entered several pieces of artwork in the FAA contest, of which all received great numbers of votes. Is this a typical reaction to your artwork? Were you surprised by your win? Max: I’m thankful to say that in person, the response to my work is usually sincere appreciation or at least it feels like that to me. The originals are up to 6 feet by 7 feet and glowing under a black light and it is a big response or reaction that I’m going for. I’ve often been alone and just stared at my own pieces for long periods and it feels great to have the work touch other people in the same way. What I tend to go for in creating a large work is to have someone enter the room and have the painting grab their eyes and attention to where they will not want to look away for some time. This is part of the job of the artist, to create a visually sticky piece, to capture the viewer’s eye, then the subject and meaning of the piece will have a much better chance to be communicated or felt. I am surprised that all the pieces would do that well especially with all the great work by other artists, and considering that they are much reduced in size when compared to seeing the large originals. All I can say is thanks to everyone who voted for them. Denise: You obviously enjoy portraiture? Is that your main focus with pointillism or do you do other subjects, themes, etc? Denise: Where do you display and/or sell your art other than Fine Art America? Max: I’ve had showings at coffee shops, night clubs, pool tournaments, book stores, and even the Kennedy Center in Washington D.C. Right now 4 of my big works are on display at the Vanguard Nightclub in Hollywood, CA. I’m currently looking for a nice venue for the next big show or permanent exhibition. I’ll be putting my stuff up on my site as well at www.maxeberle.com. Denise: Nice! Very impressive! What’s next for your artwork? Do you have any upcoming events or competitions? Max: I’ve been focusing on my professional pool career lately yet have been getting the itch to do some more art projects; a show in China would be really cool. I may get more political in the future; we live in an age of mass deception where those who have been trusted to act on our behalf actually do just the opposite, and find no problem in lying about it. This bothers me and while I find art to be an outlet to create beautiful pieces, it’s also an opportunity to reveal some truth and make a statement. I like combining elements of life and society into a collage of images, this may be where my art is headed as I’ve already created one drawing like this which I’ve yet to release as a print. Denise: Thanks Max for taking the time to share your creative world with me. I wish you the best with your art. I am certain you will achieve all your goals! No problem.